Shelburne Falls is a quaint little village that makes a great stop on any trip to Western Mass. While the Bridge of Flowers and the glacial potholes are the main draw, it is just a great place for a little stroll. Little Cafes, boutique shops and yoga studios line the streets. Markers throughout town notate filming locations of movies such as Labor Day and The Judge. Come Springtime, The Bridge of Flowers is in full bloom. It is free but donations are appreciated. The bridge itself runs parallel to the aptly named Bridge Street. Dogs are not allowed on the bridge but there are poles which you can tie their leash to. It only takes ten minutes to walk to the end and back again, depending on how slow you meander. The flowers are beautiful and there are great views of the river. The West End Pub at the end of the bridge is a great place to have lunch or a drink. Massachusetts is famous for it’s potholes. But did you know that it was home to the latest natural pothole in the world? Just walk down to the base of Salmon Falls and you will see over 50 glacial potholes formed 0ver 14,000 years ago. Geology buffs will be really interested in the light and dark banding in the rocks which formed when the continents collided (Pangaea) over 300 million years ago. The last time I was here, there were people swimming in the water and sunning themselves on the rocks, but those days are gone. The town has closed off the area to swimmers due to liability issues but it is still a spectacular site you shouldn’t miss. Baked is a nice place for breakfast, coffee or sweets. Stop into the Shelburne Arts Co-op to shop for crafts and pottery by local artists. There is a helpful visitors center in town with brochures and information. The people of Shelburne Falls are so friendly- I didn’t pass a single person who didn’t say hello. 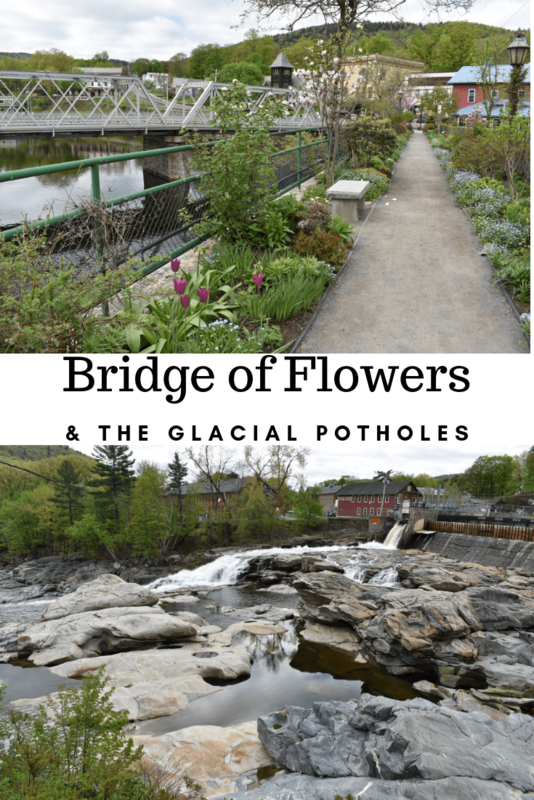 If you are ever headed down Route 2, definitely stop by Shelburne Falls to see the one and only Bridge of Flowers and the largest display of natural potholes in the world.